Ellen Mary McGuinn was born on 6 February 1856 at Sullivans Island, Charleston Co., South Carolina.1 She was the daughter of Alec McGuinn and Mary McDonough. Ellen Mary McGuinn married William G. Seiz on 9 May 1877 at Akron, Summit Co., Ohio. Ellen Mary McGuinn died on 21 October 1954 at Red Wing, Goodhue Co., Minnesota, at age 98.2 She was buried at Calvary Cemetery, Red Wing, Goodhue Co., Minnesota. Her married name was Seiz. The death certificate for Thomas John Seiz listed his parents. Death Record listed Ellen's parents. Following from The Red Wing Daily Republican Eagle, 7:5, 21Oct1954. Mrs. Ellen Mary Seiz, 98-year old resident of Red Wing, died this morning at her home, 419 Jackson street. She had been in failing health the past two years. Born at Sullivan's Island, S.C., February 6, 1856, she was the daughter of Mr. and Mrs. Alec McGuinn. When she was 12 years of age the family moved to Akron, Ohio. 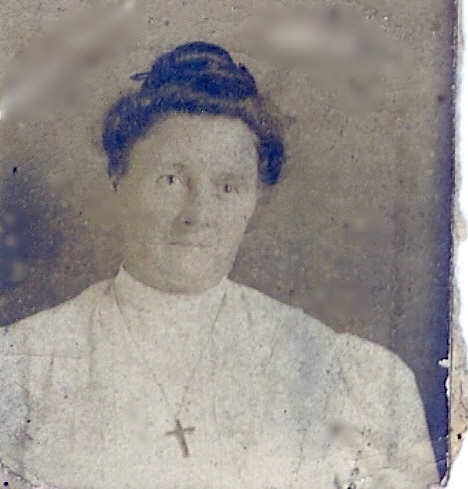 She was married to William G. Seiz May 9, 1877, at Akron and the couple resided there until coming to Red Wing in 1891. She had made her home here since that time. Mr. Seiz, who was superintendent of Red Wing Sewer pipe company factory B, died in 1915. She was a member of St. Joseph's Catholic church and the Ladies Aid of the church. Survivors include two daughters, Christine Seiz of Red Wing, and Mrs. William D. (Alice) Evans of Dayton, Ohio; four sons, William of Milwaukee, Wis; Frank M., of St. Paul, Thomas, and Ben of Red Wing; three sisters, Mrs. J.J. Lally, Mrs. Mary Tracy and Mrs. Margaret Gihoolley all of Akron, Ohio; 27 grandchildren, 47 great grandchildren and 18 great-great grandchildren. Four children preceded her in death. Funeral services will be held Monday at 9 a.m. at St. Joseph's Catholic church with the Rev. Derham Ryan officiating. Internment will be in Calvary cemetery. [S1189] Unknown article title, OBITUARY: Red Wing Daily Republican Eagle, 21Oct1954, 7:5, Red Wing, Minnesota, 21 Oct 1954, 7. Hereinafter cited as RWDRE. [S1190] Ellen Mary McGuinn entry, Goodhue Co , MN Death Record, Book 8, page 539, line 7, Goodhue County Courthouse, Red Wing, Goodhue Co., Minnesota. Job Hadden married Elizabeth Griffen. [S1191] Paul Bradley Purdy, A branch of the Purdy family descending from David and Eliza Ann Purdy with David's line from Francis Purdy of Fairfield 1595-1658, pg 3 (n.p. : n.pub., c1962). Hereinafter cited as The David Purdy Family. Elizabeth Griffen married Job Hadden. Her married name was Hadden. [S1192] Paul Bradley PURDY (321), A branch of the Purdy family descending from David and Eliza Ann Purdy with David's line from Francis Purdy of Fairfield 1595-1658, pg 7 (n.p. : n.pub., c1962). Hereinafter cited as The David Purdy Family. Hulda (?) married Ezra Marvin. Her married name was Marvin. Col. Henry Brewer married Rebecca DuBois. Rebecca DuBois married Col. Henry Brewer. John Sellon married Sarah Roberts. Sarah Roberts married John Sellon. Her married name was Sellon. [S813] Paul Bradley Purdy, A branch of the Purdy family descending from David and Eliza Ann Purdy with David's line from Francis Purdy of Fairfield 1595-1658, pg 2 (n.p. : n.pub., c1962). Hereinafter cited as The David Purdy Family. Judith B. (?) married John Ogden. Her married name was Ogden. Elizabeth (?) married Christopher Eisenhart. Her married name was Eisenhart. David Haight married Millecent Lane. Millecent Lane married David Haight. Her married name was Haight. John Wesley Clayton married Jane Boggess. [S665] B. Esther (Oviedo) Harn, "E.B. Harn Sheets, FHL film 1036595, # 196", Feb 1977 (18921 Knapp St., Northridge, CA 91324). Hereinafter cited as "E.B. Harn Sheets, FHL film 1036595." Jane Boggess married John Wesley Clayton. Her married name was Clayton. Jan DeClerck was born circa 1640.1 He married Annetje Hansen Bergen, daughter of Hans Hansen Bergen and Sarah Rapelje. Hist & Genealogy of Hoagland Family in America pg 159. His Ancestral File Number is CCXT-7N. [S1193] Unknown compiler, compiler, "Ancestral File Number CCXT-7N submitted by three individuals"; Ancestral File, 4.19 Family History Library:, 35 North West Temple St., Salt Lake City, Salt Lake Co., Utah. Hist & Genealogy of Hoagland Family in America, pg 159. His Ancestral File Number is 3Q7L-DV. [S1194] Unknown compiler, compiler, "Ancestral File Number 3Q7L-DV, submitted by 54 individuals"; Ancestral File, 4.19 Family History Library:, 35 North West Temple St., Salt Lake City, Salt Lake Co., Utah. Her married name was Bergen. Hist & Genealogy of Hoagland Family in America, pg 159. AFN 3Q7L-F2 lists name as Sarah De Rapalje, & three spouses. Her Ancestral File Number is 3Q7L-F2. [S1195] Unknown compiler, compiler, "Ancestral File Number 3Q7L-F2, submitted by 52 individuals"; for Sarah Rapelje, Ancestral File, 4.19 Family History Library:, 35 North West Temple St., Salt Lake City, Salt Lake Co., Utah. Annetje Fedden married Dirck Jansen Hoogland circa 1677. Her married name was Hoogland. Hist & Genealogy of Hoagland Family in America, pg 161. Joseph Hegeman married Femmetje Remsen. Femmetje Remsen married Joseph Hegeman. Her married name was Hegeman. Hist & Genealogy of Hoagland Family in America, pg 170. Catherine Hoogland was baptized on 31 October 1750 at Jamaica, Long Island Co., New York.1 She was the daughter of Cornelius Hoogland and Catherine VanHook. Catherine Hoogland married Abraham R. Schenck on 17 January 1770.1 Catherine Hoogland died on 8 July 1829 at age 78. She was buried at Reformed Church Cemetery, Manhasset, Nassau Co., New York. Her married name was Schenck. [S1196] George Williams Hoagland, Dirck Jansen Hoogland family history, 1657-1976 : a Hoogland-Hogeland-Hoagland-Hoaglin genealogy, pg 197 (Cleveland, Ohio: Genie Repros, 1976). Hereinafter cited as History & Genealogy of Hoagland Family in America. [S1197] George Williams Hoagland, Dirck Jansen Hoogland family history, 1657-1976 : a Hoogland-Hogeland-Hoagland-Hoaglin genealogy, pg 197 (Cleveland, Ohio: Genie Repros, 1976). Hereinafter cited as History & Genealogy of Hoagland Family in America. Jerry Reece married Janalee Cousland, daughter of Leon Roger Cousland and Helen Marie Purdy. Dodd, Jordan, Liahona Research, comp. Arkansas Marriages, 1851-1900. (database online) Provo, UT: Ancestry.com, 2001. Original data: See the extended description for original data sources listed by county. Obituary of Nellie Purdy in 1971, listed her parents. Obituary of Nellie Purdy in 1971, listed her parents. Her married name was Hagood. Dodd, Jordan, Liahona Research, comp. Arkansas Marriages, 1851-1900 (database online) Provo, UT: Ancestry.com, 2001. Original data: See the extended description for original data sources listed by county.